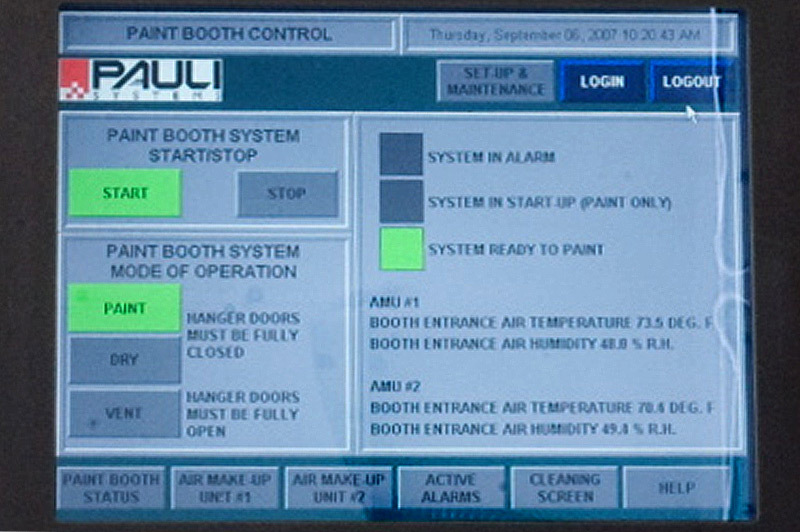 Pauli Systems aircraft paint hangar inserts enable maintenance technicians to enjoy state-of-the-art coating and repair facilities inside existing hangars. There is no need for demolition or new construction. 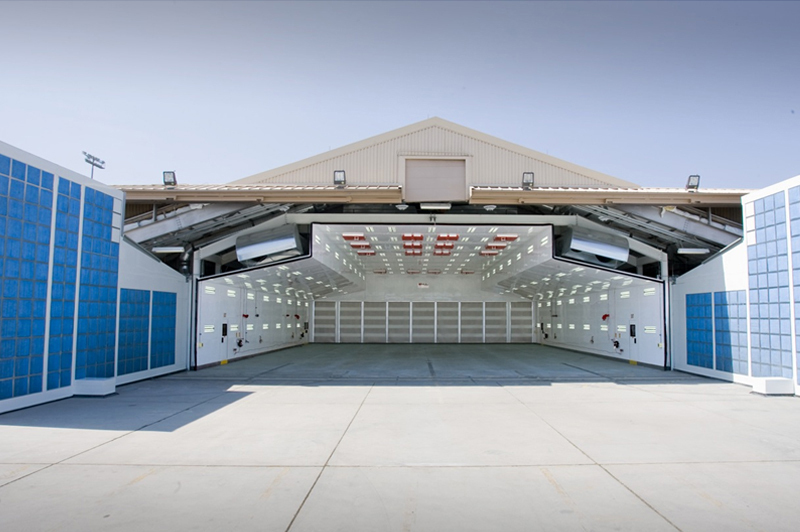 Note the integrated structural framework of this spray booth, entirely independent of this hanger at Nellis Air Force Base. 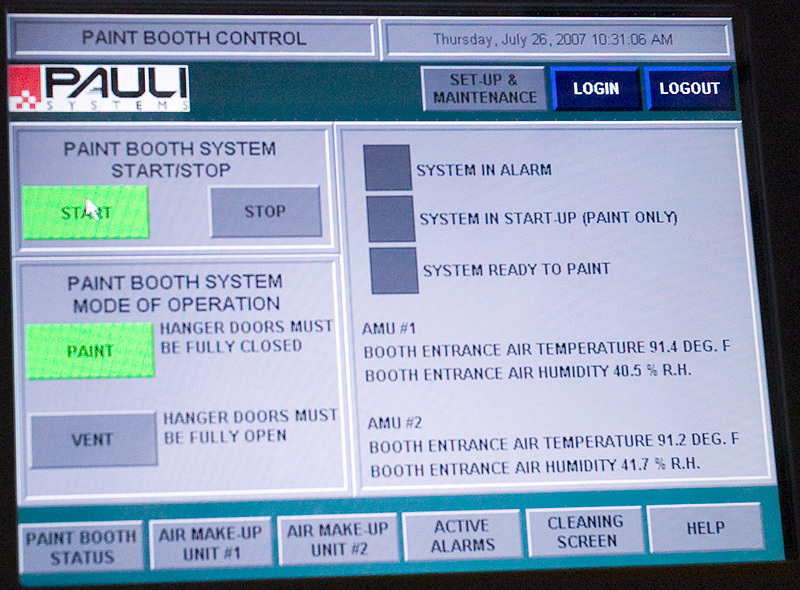 Operators begin by pressing the “Start” button in the touch screen control. The makeup air units begin the process of bringing the facility’s working chamber temperature and humidity into specified value ranges. This is accomplished by heating, cooling, humidifying or dehumidifying, as dictated by internal hanger and local atmospheric conditions. 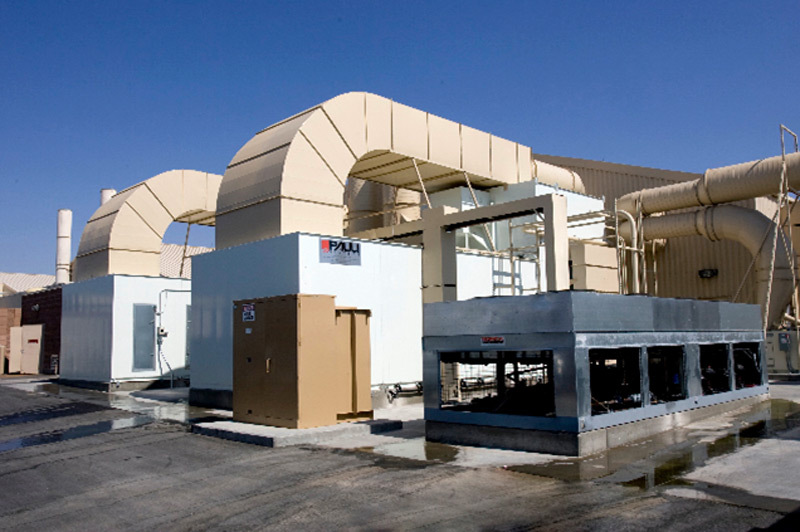 Rain or shine, night or day, winter or summer prove no obstacle to accomplishing the mission in a Pauli Systems facility. The makeup air units deliver properly conditioned air via large ducts running along the shoulders of the facility. The air exits the ducts, is deflected downward into the four-foot thick plenum doors where it is filtered and distributed evenly through the spray booth. The air flows along the longitudinal axis of the aircraft and out the filter bank in the rear. The four filters are: EPA NESHAP (National Emissions Standards for Hazardous Air Pollutants — Aircraft/Aerospace) three-stage filters (blanket first stage, panel second stage, pocket third stage) plus activated carbon VOC (volatile organic compound) filters. 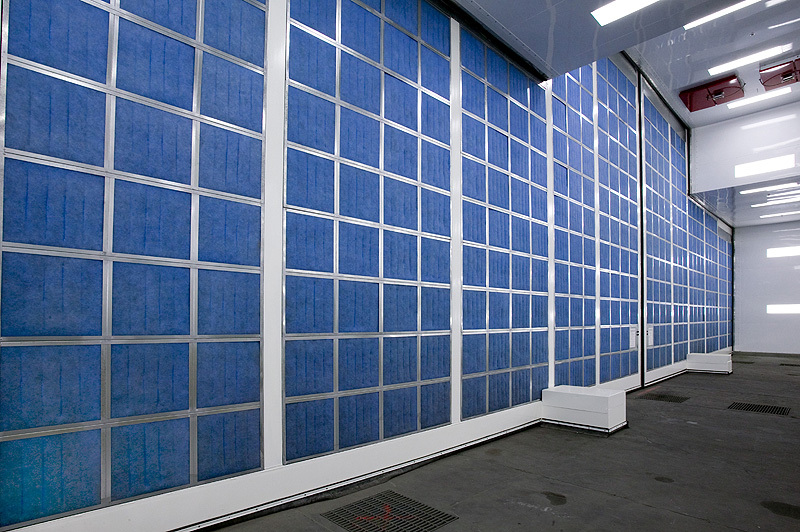 The process air, now cleaned and prior to discharge into the atmosphere, passes through energy recovery section to pre-heat or pre-cool incoming atmospheric air prior to conditioning in the makeup air units. There are several cycles available to operators including standby, coating, repair, cure, and ventilation. 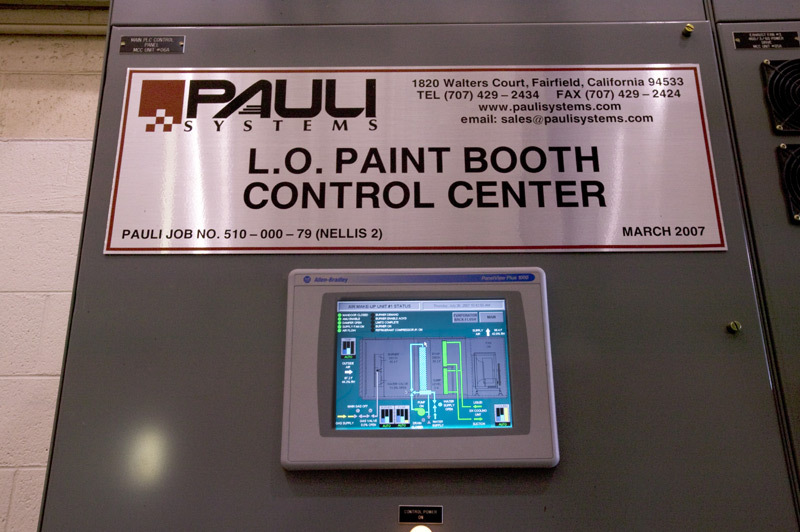 Pauli Systems aircraft paint spray booths include fully integrated motor control centers. No longer is it necessary to run outside to turn on air compressors and air dryers, then move to another area of the base to turn on breathing air systems, then yet another to... well, you get the idea. With Pauli Systems everything can be in one time-saving location. Watch the fire suppression system in action at the Low Observable Coating and Composite Repair Facility – USAF Nellis Air Force Base.